We can help you tear down and demolish buildings. Our cleanup crew can also salvage building materials to help save on landfill costs. Save on labor and transportation costs, while reducing your landfill costs. 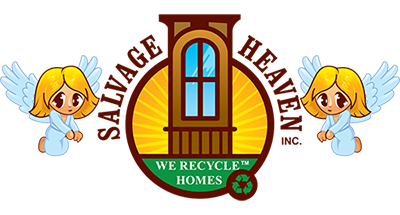 Then we create an inventory of new, recycled and used building materials to resell and promote healthy recycling within your local community. We help you implement proven methods of recycling building materials and can help you sell those materials for maximum returns & savings. Save up to 60% of retail costs when building with recycled and used building materials. Perfect for replacing antique or vintage fixtures & saving money on remodeling or material costs.